MOPDC's weekend Winter Intensive offers intermediate/advanced dancers the opportunity to explore and connect with various dances of the African Diaspora, tools for creating socially conscious choreography, and experiential insight as to ways in which Dances of the African Diaspora can be incorporated in Dance Theater. Choreography Lab - Creating Socially Conscious Dance Theater Choreography facilitated by MOPDC company members. Each day will conclude with 3 hours of collaborative group choreography making/solo work or a company repertory class, where participants will be lead through MOPDC's best practices in creating Socially Conscious Choreography. Company Rep - Participants will embody and contribute to one of MOPDC's current company repertory works. They will engage in a condensed process exploration of how the piece was crafted and will share a section of the work during the studio showing. Studio Sharing - The Intensive will culminate in a free informal studio sharing of student work and excerpts of MOPDC company repertory. Participants will get the chance to discuss their process and receive audience feedback. Monday, Jan. 21st @ 7pm. 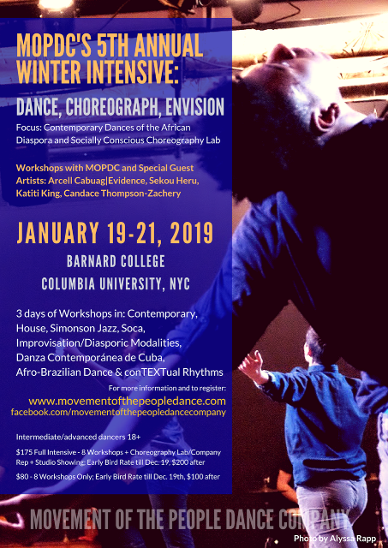 MOPDC's Winter Intensive is for dancers and choreographers who are interested in embodying various dances of the African Diaspora as well as envisioning and creating evocative Dance Theater choreography that addresses sociocultural issues as a means to educate, inform and ignite dialogue. Pay online to ensure your spot - a link will be provided after you have completed registration! Space is only guaranteed to pre-paid participants. CASH ONLY at the door, exact change greatly appreciated - $15 per class. Please see our FAQ's sheet for more details.